This past week I’ve been slowly plotting a series of tests to batter the Apple Watch and see exactly how well it’d hold up to a variety of aquatic adventures. No doubt I’ve been showering with it twice-daily since it arrived…but that’s kinda lame in the grand scheme of waterproof tests. So while a few people have casually doggy-paddled around their backyard pool with the watch, I wanted to kick it up a notch…or, rather, a lot of notches. Of course the reason any of this matters is that the Apple Watch isn’t officially very well waterproofed. It has an IPX7 rating, which is less than most $15 Walmart watches. However, a few years ago that was actually commonplace for expensive GPS watches on the market. You’ll remember watches like the Garmin FR305 and Polar RC3 having only IPX7 waterproofing. Nowadays though, virtually all GPS watches on the market have 50-meter deep or better waterproof ratings. • Dropping Apple Watch or subjecting it to other impacts. • Submerging Apple Watch in water for long periods of time. • Swimming or bathing with Apple Watch. water skiing, wake boarding, surfing, jet skiing, and so on. • Wearing Apple Watch in the sauna or steam room. Submerging it for long periods of time: Check! Exposing Apple Watch to high velocity water: Check! Plus of course, a few little surprise tests too. So to start on Saturday I ran the 10-miles off to the pool and began putting my plan into action. First up, was a swim. Not a terribly fast swim, but a swim nonetheless. I was actually most worried about this test, not from a watch perspective, but rather a logistics perspective. I was hopeful the pool would be rather empty, and not teaming with folks potentially dorking with the camera. Thankfully, it was reasonably quiet with only 5-6 people in my lane. And with my setting up on the far side of the pool, nobody messed with anything. As noted there’s been a video or two posted by folks of people sauntering around their backyard pools, but nothing doing any actual lap swimming. It’s the wrist hitting the water that’s so difficult for watch waterproofing due to the impact forces, so that’s really the piece I was interested in testing. Pretty impressive…at least assuming impressive is that it survives just like any $15 watch should (let alone a $350 watch). While the heart rate shown was more or less all over the place (and not at all viewable while underwater unless you managed to get lucky and have the wrist detection actually trigger underwater), the watch itself otherwise survived. 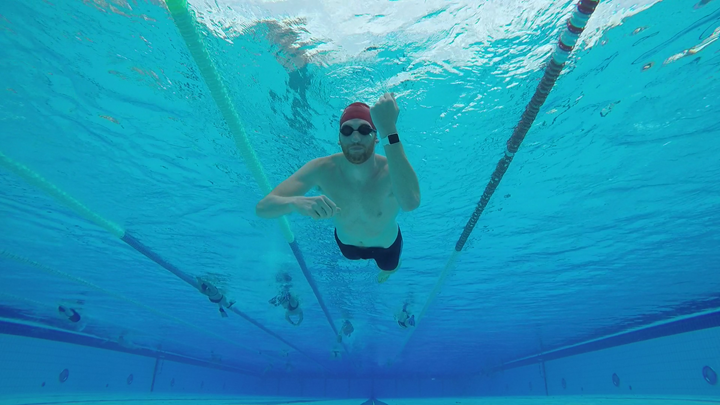 Note that the Apple Watch unfortunately doesn’t take advantage of its internal accelerometers for any swimming metrics (i.e. lap distance/pace/stroke type/etc…). So to that end it’s really no different than a 1980’s stopwatch when you’re in the pool. So given the lack of swim metrics (HR or distance), and the fact that I (just like Apple) still wouldn’t recommend swimming with it – I’d probably just leave it in your locker for a safer experience. It wasn’t until I was heading out of the pool after both completing the swim tests and shooting a bunch more video, that I noticed the high dive platforms. And they only caught my attention due to a man going plummeting off the 10-meter high (32.8ft) platform. I watched as he did it again. And then watched as some kids went off the shorter 5-meter high platform (16.4ft). As I stood there watching them, it occurred it might be a bit of an interesting test for the Apple Watch. After all, that falls right into the ‘high velocity’ camp of things listed not to do. So… I decided to give it a go. It’s of course at this juncture that I realized the last time I was on any sort of official diving board/platform was probably two decades ago as a kid. Visions of horribly wrong belly flops danced through my head. Nonetheless, up the tiny ladders I went. First off, once I got to the 8m platform…holy crap that’s high up. It’s a bit hard to realize, but this is basically higher than the building next to it. Hells no! Thankfully, as you saw, I managed to recruit a volunteer to jump off the crazy structure on my behalf. He seemed much better at it anyway. Plus, he didn’t die. And neither did the Apple Watch. It worked just fine after that – three dives in total! Finally, it was time to take the unit into the DCR Cave and run it through the dreaded waterproofing chamber. I’d use the exact same automated test setup that I do for any other watches that I’ve tested (like the Fitbit Surge, the Garmin Fenix3, or the Garmin Vivoactive). The only difference being those were all actually rated for 50m waterproofing. As for the Apple Watch? A paltry 1 meter. Yes, as in: One Meter. No typo there. Still, my automated test cycle calls for two separate step-dives down to 40-meters deep. And changing that automation script to a lesser depth? Well, that would be a lot of work. Like perhaps 30-40 seconds worth. Time I could have spent eating part of a chocolate bar. So instead, I just left it as-is and went to town. I’m impressed, it’s still chugging along after that – with not a single sign of any issues at all. Clearly this is all more than adequate for any sort of casual sweat or showering. Though I’ll definitely be keeping an eye out over the next few weeks just in case. With that – thanks for reading (and watching)! why on earth did they not waterproof the iphone 6 ???? While not submersion, I find mine is far more resistant than one might thing. I never protect it in my back jersey pocket, so it’s always getting soaked with sweat. And even when I go swimming I’ll sometimes leave it in my bag at the end of the lane line, which sometimes gets soaked too. And of course use while in the rain (walking around/etc…), no issues aside from screen responsiveness due to waterproofing. That said, I’d love to see them up it to the level that Sony, Samsung and others are doing. When I was phone shopping in December, the store manager who helped me said he wouldn’t advise putting the Sony Z3 Compact in a jersey pocket unprotected. Maybe that was just he’s tired of dealing with customers who’ve drowned their phones and tried to get warranty replacements. But I’ve come close to drowning two removable battery Android phones just from the pinholes that develop in my Ziploc bags over three weeks or so. I wound up with a non-water-resistant phone that I preferred for its other features. Years ago I destroyed my brand new iPhone 3GS when applying the ZAGG InivisibleShield solution Spray on the screen. Since then I have been very careful not to expose my iPhone to any sort of liquid (well, until yesterday when I had it in my back pocket during a shower rain. Luckily it survived). It should be pointed out that IPX7 just means the Apple Watch was tested for 30 minutes at a depth of 1 m. The IP rating does not indicate its full tolerance. More importantly, the next level up is IPX8, which is indefinite duration at depths beyond 1 m. Apple should have made up their own rating like everyone else. Thank you for the report/post/tests! I have had my AW Sport for almost three weeks (I actually bought instead of a Garmin 220). I’ve been running with my iPhone for GPS (Nike+ GPS app) for years but last summer decided to move from 5k distances to half marathon and wanted something on my wrist to assist. I had been a bit careful with my AW from getting wet. No shower with it on, no running in the rain. I did get Apple Care+ but still. Glad to know I can relax a bit with that. The AW has worked great for me. I’m not a professional. I won’t ever win (or even place in my age group). I run/exercise for fun, health and social aspects. But as most I’d like to improve. That doesn’t mean win, but improve. As such AW is a great tool. Just like a dedicated GPS watch, just a tool. Yet, now I have a very good activity tracker (NikeFuel band now in the trash) and ability to track other workouts on non-run days with much more accuracy than my guessing. I’m not sure I understand the “hate” for AW for sports. Is it better or worse than other smartwatches? Have no idea. 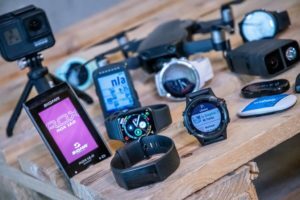 Is a Garmin or Polar better specifically for running? Of course. But since I only run about 6-7 hours a week, I think the AW a better, more versatile option. For me. Plus I can wear it to work, meetings, etc. Overall fitness wise, the AW has exceeded my expectations. I wish there was a little more customization (for example on exercise to adjust from 30 min to say 45 min), but my guess is that will come. For running, it does exactly what I hoped. Allowed me to easily see my progress/pace/time much easier than on my phone (if I bring a phone. Remember you only need your phone if you want GPS. Which is not always), see any incoming text (and who from), change songs and volume easily. It does all this easily, intuitively and seemless. Just remember, that if it breaks for whatever reason, and there is the slightest sign of humidity on the tell-tell strip inside, they will void the warranty. As covered numerous times before – they can’t. The unit says it’s waterproofed to IPX7. Thus, any water could very well be just normal use within those specs. Apple warranty guidelines for service centres show pictures of the heart rate sensor with condensation on it and says this is covered. Here is what I think water will do to the Iwatch by taking showers with it and washing my hands. That is all I’ve done. my iwatch got the same prob w/ Landon LaBoon. i noticed it after playing tennis 4-5 days back. can this still be remedied? bought it last Sept 9, 2015 though (over 1 year already). Or what did Landon Laboon do to restore the watch back w/o the underneath screen-moist damaged? what are my options? Glenn, it depends. If you didn’t purchase Applecare+ then you might be out of luck. But it is very close to your warranty and Apple might help you out. Give them a call. This should be covered in warranty (including Applecare+). Pretty clever of Apple. Officially they say it isn’t waterproof, but let media and the public know that actually it is. This way most media (you included?) almost present it as an amazing thing, that it appears to be waterproof. But remember, that Apple for sure wont cover any problems related to water. Instead Apple laugh all the way to the bank, when people have to buy a new watch after having bricked their first one. Apple should really step up and give the watch a proper rating and back it by a proper warranty! Do you really think that Apple cares that much about a few people buying a couple of extra watches? It’s pocket change for the, and not worth to risk their reputation. Instead this is a case of under-promising and over-delivering. Having people be unexpectedly delighted is important to Apple. “However, a few years ago that as actually” typo aside that was thoroughly entertaining, Thank you. I chickened out at three meters, can’t describe the feeling other than dizzy at the temples and week at the knees, so kudos to you! I’m not sure I understand the ammount of effort and number of posts you are dedicating to the Apple watch. If it was any other brand, would you even look at it twice? I’m not trying to bash Apple here, I’m sure it’s a fine smart-watch (iPhone 2nd screen really..) but I would really want to understand your dedication to it. He knows that, you know that and I know that. But the Apple watch is pretty mainstream and is all over the news, and many folks are interested in it. As Eduardo noted, it’s of significant interest to many readers. I get more e-mails/tweets/etc on it in a given day than any other watch does in a week right now. As you both pointed out, it’s clear that for certain segments of sport – it’s really not ideal. But it’s also becoming clear that things aren’t as bad as previously thought. I’m seeing reasonably promising sport/fitness HR sensor accuracy while running, and of course the smart watch features with 3rd party apps pretty much blow away anything in the dedicated fitness realm (i.e. Garmin/Polar/Suunto) today. It’s a watch that many of us are considering to buy, because it can be a potential all-in-one solution to cover many need incl sport (combined with iphone and 24/7 sleep & activity monitoring) and because it’s possible to wear in an office type job. Let’s be straight, the Garmin etc looks like something my 3 years kid has made in Lego. Only of the reasons why I currently use a Polar M400 24/7, it’s less ugly some of the other high end and functional rich watches. So Ray, keep up the good work and keep the Apple Watch in scope as well. I’m sorry, but I don’t buy your logic. If you want it as a smart-watch and daily tracking, then yes, it is fantastic and great astethics. But for serious training? Having to bring an iPhone with you? For running with it jumping around? How about bike sensors? How about swim tracking? I’m leaving the discussion, this post is beyond ridiculous. The Apple iSheep are in full delusional mode thinking the Apple Watch is a sports training device. For serious sports, once the access to the heart rate data is open for apps, it will be the most expensive heart rate sensor in the market, nothing more. Most cyclists bring their phones with them, so that’s a non-argument. Runners it varies quite a bit, in some countries many will run with the phone, and in others, less so. Just depends. Plus, I assume you know that with apps like CycleMeter/RunMeter I can easily pair to any ANT+ or BLE sensor, including power meters. I don’t think anyone is saying that it’s a replacement endurance sports watch today in it’s current hardware version. However, it is a very viable sport watch option for what is the rest of the population (which is realistically 95%+ of people that workout). 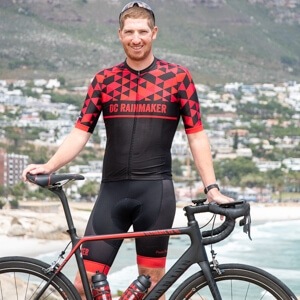 I want a solution that records my heart rate, provides instant feedback about it, and that allows me to upload my MTB ride result to Strava at the trail head at the end of a ride. That’s all I need, and I’m sure there’s plenty others who are the same. If you don’t like article about the Apple Watch, why not just ignore them? The Apple Watch is as much of a sports training device as the Moto 360 is as a sports training device as a Casio stopwatch is as a sports training device. I’ve seen people at local running stores for group runs who have been using Android watches (paired with phones) to track their runs. I still see people using their smartphones to track their runs. I don’t see how it’s any different for an Apple Watch. For running and cycling, I will always have my phone on me for safety purposes. There is this subtle difference between a Casio stopwatch, a Moto 360 and an Apple watch that makes the latter much better at being a sports training device. Study the specs closely and you may be able to discover it! I think you will find that the Moto 360 has in built heart rate – as does the LG – G watch and Lg Urbane + Asus Zenwatch. My point is that while I acknowledge there is a lot of interest in the new Apple watch, there are some established players in the market with similar specs and functionality to said Apple watch. And these devices are more applicable to those not in the Appleverse. I also acknowledge that there is only one Ray, but while he is venturing into this new world of companion wearables, I think it would be fair to at least comment on Google fit and the Android wear devices available and what they offer for those without an iphone. I, as I suspect a lot of readers would really appreciate and respect his thoughts on this emerging segment. Please keep up the reviews of the iwatch! Don’t narrow your website too much.. The whole point of a review site is to analyse the quality and usefulness of the product! Porto – nice that you are such a purist but frankly the more products reviewed the better. Personally I would like to see DC rainmaker branch out even more. 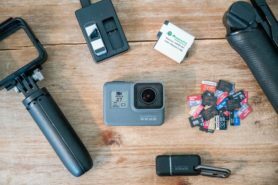 How about some other electronics reviews regardless of their sporting application? I think for now I’ll mostly focus on things that have some sort of sports/fitness tie-in with technology. Be it watches, action cams, activity trackers, or whatever else looks interesting to me. But I occasionally wander too! That alone would keep me from moving to Paris! Haha, my thoughts exactly. I think my pool is crowded when there more than one orher person in my lane, let alone 5-6! ? Totally. That would drive me insane.I struggle in NZ when there are three of us in one lane. Saw the comments above and wanted to THANK YOU for reviewing the Apple Watch. I am really interested to see if I can use this in combination with my iPhone 6 to use with Strava (and hopefully replace my Garmin). my thoughts exactly! Ultra marathon training preparation in process… ? I like it, suits you sir! Every yeard has to start somewhere…. I’m already looking forward the “beard” review in the perfect DCR style. Interesting tests! But it does make me wonder WHY the rating is so low. The watch does seem up to it. Is it as someone suggested a warranty thing? The thing is, because the Apple Watch doesn’t have a decent rating, Apple can’t really offer swim metrics – that would be like admitting the watch can be used in water. So it looks like this IPX7 rating is preventing Apple from offering functionality that would make it more popular, and that is strange, it’s feels like they’re shooting themselves in the foot with this. As for those swim metrics – an app could be developed for that, right? Would Apple allow it, given the fact it would promote use of the watch that would void your warranty? Version 1.1 could offer swim metrics and ‘force’ early buyers of 1.0 into an upgrade?? Could issues with these tests show up at a later date, or would you just expect the watch to either survive or not? I’d have to defer to a dev person if the SDK allows for enough direct access to the accelerometer data to develop such an app. Fwiw, it does not today allow for access to the HR sensor. Though, it sounds like that’ll likely change later this year. right now, nothing runs natively on the watch except Apple’s apps. Literally everything runs on the phone and streams information to the watch. This may change in the future. WatchKit doesn’t allow access to any of the sensors. Isn’t WWDC sometime later this year? That’s a nice test. For sure it shows that a new Apple watch can be used for watersports. Just while everything is nice and tight at the beginning, I’m wondering what’s going to happen after like 3-5 months. The body of the watch, buttons, sealers and glue are going to work and age. It’s all going to make the tightness somewhat weaker. Then we’ll see how good it was. For one-time use like this you’d typically see effects within the first 24hrs. For continued use (i.e. daily swimming), then yeah, it’d likely show up down the road. It’s interesting – in the vast majority of waterproof issues that I see with other watches, it’s actually rarely the water itself that causes it. Rather, it’s very often that one drops the watch on a hard surface (i.e. the floor) first, and then days/weeks/months later goes swimming. Often there can be tiny cracks not even visible to the human eye that cause the ingest. Yup, they did until 4 at least. One in the headphone jack, one in the connector port and one on the board. The challenge they’ll have with denying folks a warranty replacement though is that technically the device is certified to IPX7. Thus, there’s no way for anyone to know whether the damage was caused via IPX7 conditions, or not. Water ingest manifests itself in so many different ways (usually through cracks in cases or seals), that for Apple to ‘prove’ anything would be impossible. Apple employee: Do you shower with the watch? Ray, nice mini-review post! Appreciative of the work that you do for the non-professional fitness market. In addition, I am enjoying the podcast a lot as well. The topics, questions, and length of it is just right. Looking forward to your final posted review of the Apple Watch. Did you play with the buttons or crown while under water? I recall that being an issue for some watches in the past. I still argue the Gear S with built-in cell is a better option since it means one less device to carry. Although at this point t I often cary my garmin and S.
Yup, I used the buttons a fair bit, and the crown a little bit. Interesting. I’m just going off of the large printed labels next to each level. I can’t for the life of me imagine Apple allowing apps in the store for swimming when they don’t offer a model that’s compatible, on their terms, with putting the unit underwater. Ie. until there’s a unit with a higher waterproofing level, do not expect them to allow any apps that track swimming or other watersports. And to me, I would like to see Ray make one thing more clear: Just because he buys and tests ONE unit and THAT unit appears to have a much higher level of waterproofing than advertised, that is NOT the same as Apple “under-promising and over-delivering.” Not in the least. That just means the one Ray tested could be an outlier or Apple reserves the right to change suppliers of items and end up selling watches later under the same packaging that will NOT hold up to this, etc. It’s nice that it’s passing these tests, and promising for those who really want the thing and need it to be better than advertised. But you’re still going out on a big limb if you buy one and expect to swim in it. And no, I’m not an Apple-basher. While I have no reason to replace my fenix3 with an Apple Watch, I’m all Apple all the time with everything else. I’d agree that one shouldn’t expect to swim with the watch long term. Going for a dip in the pool post-run or the shower, no problems. I’ll probably add another disclaimer (though, I believe I mentioned it in some of the videos anyway). Sorry, but I have to ask this. What’s with the beard? Seriously. Love this review! Looking forward to ring how the watch holds up with continuous water usage over time. I, for one, will not hesitate to shower daily with my watch and I definitely feel more comfortable swimming with it after seeing this! Have you posted any reviews or observations on any other type of workouts using the Apple Watch? In particular, those using the Workout app and measuring HR? Just a tiny bit. I created two additional videos this weekend on workouts using the native workout app. One for running, and one for cycling. Hint: Running went well…cycling, well, not so much. I’ll likely post the videos Monday/Tuesday once I have time to combine/edit them. Great. Looking forward to it. I have an AW and have had good results including a 2 hr cycle (on trails not roads). My results matched my prior results with chest strap. My runs have been good but the Pace shown on the Workout app seems to always be too slow but the final Pace is OK. For runs, I have calibrated using my iPhone but I am still carrying my iPhone for both runs and cycling. And for indoor cardio, it seems to measure HR very well. There is a slight bit of a lag when doing intervals but the average HR seems to match spot on. Apple’s active calorie calc seems to be more conservative than others but I don’t know which is correct. And there seems to be a bug/incorrect calc for resting calories shown in the Activity app. It is showing resting calories to be much too high. I’m looking forward to your first reviews and am curious about the issues you had cycling since I had a good experience. Now the workout reporting (no maps, weekly summaries etc.) compared to some of the iPhone workout apps definitely needs to be enhanced. LOVE . THE . BEARD ! The heart rate monitor on my Apple Watch Sport has has been spot on for runs and other indoor cardio activities but struggled with CrossFit, which isn’t unusual for optical heart rate monitors. One thing I love is the option to pair Bluetooth HRMs. What most of the haters fail to realize is that this is very much a gen1 device. Soon, apps will be native as opposed to glorified widgets and future iterations will have gps and better battery, not to mention more sophisticated sensors. Even this one has a disabled pulse oximitor I believe. Within 5 years, it is very possible this will be the best sports watch in existence. in the end Apple shows how to pair a bluetooth device with the watch. In this case a Heart Rate chest strap. with another device by extracting the info via HeathKit API. CoreLocation already provides API for Acceleration data and even GPS. and a third party app should show all the workout info easily. Yes, I asked him if it was possible to share the app/code, which he did. Currently his app pulls the last 600 data points worth (the Apple Watch records at only every 5s when in workout mode, 10m when in non-workout mode). Still, it would be reasonably easy for someone to expand upon his idea and allow you to simply pair any BLE strap at the same time to the app, and then have the app (with a 5-second delay) pull the data from Apple Health via the API. While I’d agree in general with his results while running (it was just one test of his), I’m seeing lots of oddities cycling and HR data. I’ll bring them up to the Apple folks, since they sent me a slew of e-mails over the past few days wanting to talk. It’s great you are interacting with Apple! I thought you should have been a beta tester and/or one of the initial reviewers. I think the AW has a lot of potential even as a gen. 1 device. Apple sent you a slew of emails? This I don’t get; in reviewing sports tech you are the Golden Standard. Apple should’ve emailed you requesting to talk way before they released the Watch. But whatever, hope you get together soon and are allowed to post about it. As for the Watch seemingly being waterproof: this news brings water to my i’s. We chatted briefly prior to April 24th, but in short they didn’t seem to have time for any questions or hands-on access prior to release. Now…well, they apparently have time. I was really surprised when you were not included with initial reviews. I found most of the initial reviews very frustrating because the tech/hipster 🙂 crowd who reviewed it did not cover or barely mentioned the fitness capabilities. Glad you have Apple’s ear now….. If I were you I’d pop the question if they can envision the possibility (and usefulness) of putting in a GPS chip. Personally, for kicks, I’d also pop the question if they’d allow for cellular capability in a future model. But since the iPhone brings in 70% of their entire revenue I don’t think they’ll ever do that. Ray, thanks for the feedback on the new watch. Can you comment on whether it would be possible to pair the AW with an external GPS that was bluetooth enabled? The omission of GPS is obviously a major issues for people who read your reviews. I imagine that like myself many are not willing to run with their iPhone, but I wonder if you could sidestep the omission of GPS if someone released a GPS unit that you could clip on your shirt that talked to the watch. Thoughts? I don’t believe there’s a way to do so directly. But perhaps if someone develops an app, but I’m not sure of the Watch Kit SDK allows for direct BLE connectivity to random devices that aren’t the phone (beyond a HR strap). I found similar oddities that you mentioned with heart rate while cycling. The heart rate would drop close to my resting HR and then return back to my exercise HR. This would occur several times during a single ride. I was wondering if it had to do with the bend in the wrist and the sensor positioning. Have you observed any patterns? Going for the Zach galifianakis bearded look recently? The girl must want a man from a 70’s! Enjoyed the water test very much. Living in Florida, water is a daily part of life via multiple means, and the weather. I won’t purposely try to test the Apple watch water limits as you did but nice to know a dip in the pool, or getting caught in the rain, won’t cause a panic attack. What will aw users do in winter, waiting for the summer? Operating temperatures are from 0°C to 35°C. It’s actually not an unusual operating range for GPS watches either, though some do about 5* colder (to -5*C). Really? The epix manual shows an operating temperature from -20°C to 50°C, fenix 3 from -20°C to 60°C, for example. Ok, that’s may not be fair, because I am comparing real outdoor watches (garmin) and a non outdoor watch (Apple). Btw: the apple watch is an non gps watch! No, it’s not really fair. Those are units designed for those conditions. That said, people are comparing them against mid-range GPS watches (I picked the FR220 as an example temperature range). But perhaps you can put it for testing also in a freezer, for swimming and the 40 meter chamber it isn’t designed, too. Yup, I’ll try a freezer. Easy enough. I wish you would do a review of the sony smartwatch 3, is something you could actually use as a fitness device replacement. It doesn’t have optical heart rate, but it is ble, and GPS on board. I’m really close to ordering one to replace my now dead timex global trainer. Interested in your hints re exercise – my AW is dreadful at measuring run distance (to the extent I’m running with my Fenix 3 on the other wrist) but seems fine for cycling (compared with Edge 1000). Looking forward to the full review! I’ve never run with it without having my phone with me, so it’s nothing to do with calibration – and it consistently measures .15 to .2m short on the same 4 mile run. I even measured short when I had the Strava app running on the same phone that measured 4m exactly. It’s no biggie, as I don’t expect it to replace any of my Garmin devcices, but if I’m travelling with work it’d be nice to think I had something that would at least measure distance accurately. I’ll argue that the GPS radio receivers of the iPhone are just as accurate, or more so, than any wrist-worn GPS watch. Better antennas, better power, same 1s sample rate, and actually many phones and GPS watches share identical sourced chipsets. Apps on a phone and GPS watch firmware use formulae to determine plotted map accuracy based on moving averages and plausibility. GPS watch data accuracy has an advantage of being worn in a consistent place; The wrist. Phone GPS is optimised for hand-held operation, armband too as long as its material isn’t unknowingly Faraday-Cage-like. So, device and user variables aside, how do you know your 4 mile run is precisely 4 miles? 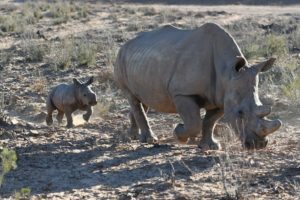 How do I know my 4m run is 4m? Because I have run the same run literally hundreds of times with several Garmin and Suunto devices, as well as my iPhone running Strava (the same day the AW activity app said I’d done 3.85m). It’s 4 miles, and the Apple Watch measured it consistently short – we’ll see what it says after 1.0.1 (which is supposed to fix some fitness related issues). Do not buy it if you have dark skin…..I found out the hard way after using to Mio’s that if you have dark skin optical HR does not work!!! I have already read some complaints on forums about the Apple Watch not working with dark skin….stay away!! I’ve never commented here before but have lurked for years (ray, your reviews are great!) – but I’m commenting to say this is a myth. I’m black, optical HR works fine. There’s no other way to put it. We’re talking 99% accuracy as well, if not higher. My friends who have darker skin say that Alex is right. Tattoos and significant skin deformities may alter the optical HR monitoring but not skin tone. Between the beard and the dog, today you have become a man. Despite the high-dive incident. Remember to use conditioner after swimming, or the beard will scratch The Girl’s face. Chlorine and soap will turn the beard into a brittle scouring pad. As for the Apple watch: I’ll wait for the 3rd or 4th generation. Ray will now be receiving his very own bottle of conditioner! I bought an Apple Watch and I think it’s great, even though it shows how many areas could be improved for v2. And now that I know Apple is working with Ray, I feel even better about v2. Can’t wait until the intro for v2 when they talk about the Apple Watch measuring swimming like they’re the first to do it! I received a GoPro as a gift a few months ago and hadn’t used it so I thought I would try to record some swimming to try it out. Worked better than I expected, only really limited by the clarity of the pool. I was thinking of trying it at another pool I frequent where the water is a little cleaner. The pools I go to are usually fairly empty, I was the only one there yesterday morning, but it dawned on me that if there was someone else in the pool they might not appreciate a camera there. 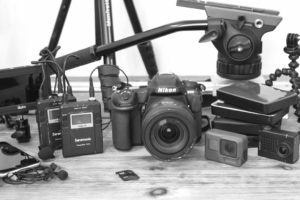 What is the proper etiquette when using a camera while swimming? Do you usually give a heads up to others that it’s there, or only if you’re splitting a lane with them? Or do you basically assume they can see it sitting on the bottom of the pool flashing? 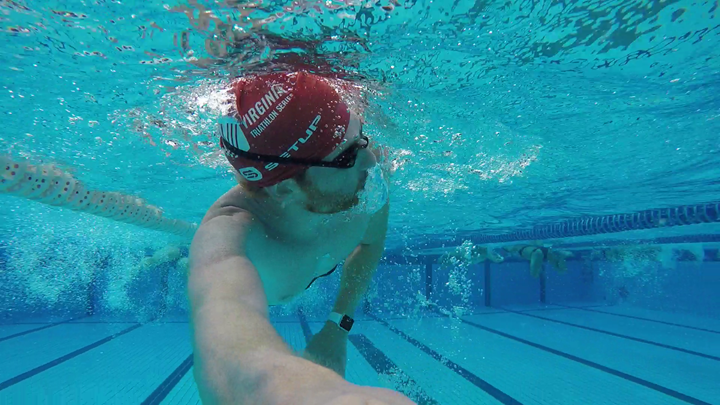 Do other swimmers seem to get annoyed when you drop a camera in, or do most of them not care? But misspelled his name in the process. My problem with the iWatch as a runner and occasional cyclist is that the GPS tracking on iPhone is always an absolute car crash in my experience. Now this may be down to living in London but my trusty 920XT tracks superbly here so until Apple sort this out the good hardware + poor software on Garmin side > iWatch/iPhone. I’ve ditched dedicated GPS units years ago because they didn’t have any benefit over phone GPS units. It’s not as if they are using different technologies under the hood after all. If you think that the cellphone GPS chipset sets are equal or superior to dedicated handheld units, you clearly don’t know what you are talking about. I’m a firefighter with the forestry service and would not trust a phone based GPS with my life. Would you,as a firefighter, entrust your life to any consumer grade GPS unit? That’s the context of the discussion here obviously. There is no question that a professional GPS with a large antenna will provide a better results in worst case situations. But that’s mostly because of that antenna. The algorithms that are used to calculate the position are the same. There used to be some amount of differentiation in the number of satellites that could be used for the calculation, but with the progression of Moore’s law, that advantage has receded over the years as well. For sports track recording, there biggest reason to use a dedicated GPS unit instead of a phone is form factor. 1) That is one heck of a pathetic site. 2) Why did they lower the YT vids res to postage stamp size? Great tests conducted but i am curious to see how the Stainless steel version would hold up. Any chance you will do tests for the SS Apple watch? For what reason would that be? Since the Watch will be the same, you’re asking him to review a watch*band* which is unlikely to read on a tech site covering sports. I also would expect stainless steel to suffer from wear and tear the same way as used in daily life as opposed to using it during a sport. To be fair, it’s not the same, is it? The Sport is aluminium, the stainless steel’s, well, stainless steel. Can’t see why they’d behave any different, mind. How about a salt (sea) water test? Great review and great place for the review !! You are my neighbor ! Indeed – my favorite pool in the area! Nonsense, engineers are always designed with a margin. Foxconn assembly level is bad, so that a larger margin is needed for the design. I’m not thinking of buying one but would like to see a salt water test for this and other waterproof devices you use/test. My Garmin Swim was fine until I used it on holiday in the sea. Soon after it started to leak, the buttons started to rust and I assume this is what caused the waterproofing to fail. When scuba diving the salt water use to wreck havoc even with propper scuba diving watches. The Suunto computer I used was fine but the apparent scuba watch rusted after a few months use. So I think testing in the sea if the chance is there is a good idea for this and other devices. Well what can we expect from a cheap $149 device. Apparently not much. The manual makes no mention if its IPX rating; omitting this info should tell us something. I think you just had a random one-off incident. I’ve never heard of anyone killing a Garmin Swim through use in salt water. Many pools these days are going the salt-water route. That said however, it’s generally considered good practice to simply rinse off any device in fresh water if in salt water. Obviously not going to kill it if you forget once, but if you’re taking a shower after, it’s super-easy that way. 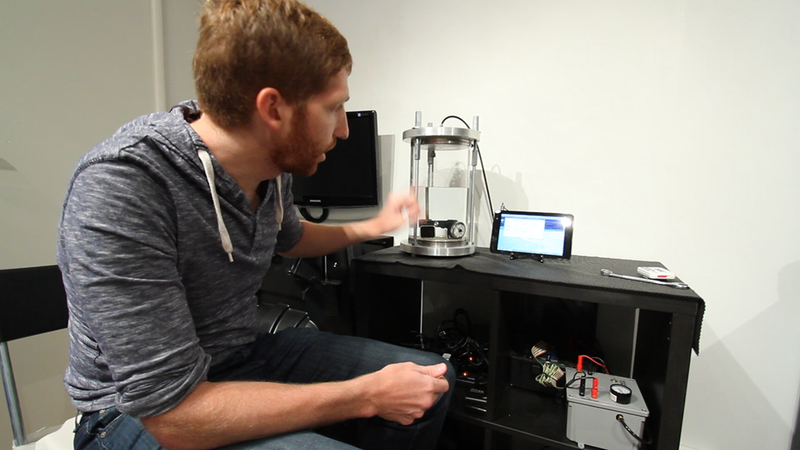 Where would a person go to get an automated test chamber setup like that? I worked with a dive company (Ikelite) to have it created. The test in the pressure chamber does not proof that no tiny water bubbles get into the case of the watch. If there are bubbles inside the case, they do not disturb the function of the watch at the moment, but they may start corrosion. Some weeks or month later, the corrosion may affect the operation of the watch. 1 Fill some water in the chamber and place the watch above the water level. 2 Close the chamber, apply pressure and wait some hours if any air is pressed into the case. 3 Turn the chamber so that the watch is under water, release pressure and watch for tiny air bubbles leaving the case of the watch. If no air is pressed into the case, hopefully no water will be pressed into the case too. I don’t think these watches can be compared. One is designed as a smartwatch which also is capable for sports use and the other is designed for sports use which can act like a smartwatch. It’s like comparing Windows vs OSX; they were designed with a total different mindset and goal. I’d agree. So vastly different. Totally depends on what your focus is. If you’re more office worker with very occasional runner, then the Apple Watch might be better. But if you’re at all a frequent runner/cyclist, the Fenix3 (or some other sport-specific watch) is definitely a better bet. Article is in French but it is your video. No reference to your name, website…. your music choice is … your choice ! Ray, is it possible Apple Watch connect to an external GPS via bluetooth? I live in Brazil and I think not safe running with the Smartphone. Not directly, not. At this time only via the phone. Ray – great article. I’m waiting with great interest to read your full review of the Apple Watch. When do you think you’ll be able to upload it? Thanks as always for the really useful reviews. Not quite sure to be honest. Roughly aiming for end of the month, but it could slide a few days into early June. I would be wary of a single watch test. I’ve seen and owned other watches that one would fail with soap and water and another (same model) lasted and lasted. If they don’t say water proof or good when swimming then don’t push it or expect to send it back eventually. Hi, did you already pair the watch w/ an GPS or BT-strap? Is the iPhone required? B) Pairing directly to a BLE strap (watch > BLE HR strap). Anyone else having issues with their Apple Watch heart rate monitor since the 1.0.1 update? Mine no longer taking readings every 10 minutes consistently and the accuracy of the HRM during rides and runs is now terrible. Prior to the update it was spot on compared to my Wahoo Tickr chest strap. There is much discussion of this on Apple forums, but thus far no comment from Apple. While there have been several reports of issues and even a few articles, I seem to be experiencing no problems. I’m still getting consistent reading. I see a few reading from yesterday were a bit high (100) but otherwise all look normal. I think for some this is the first time they watched their own HR readings. Thus they maybe a bit oversensitive to an odd reading or two. This could be any number of things and things like HR and BP should be taken as an average with a large same size. One thing I didn’t realize is, normal readings seem to stop while exercising. For example, yesterday the HR list shows reading every 10 min or so except for my hour plus run. I guess they figure you are using or capturing that somewhere else. I use the Nike+ GPS running app. I do have a BT chest strap, didn’t wear yesterday. Re your point about readings stopping during exercise: there’s a known bug caused by the new firmware (1.0.1) in the watch that’s causing the HR frequency to go wonky. Mine seems ok(ish) but there are times it’s been a bit odd. It’s certainly nothing to do with an assumption people will be using their own HRM – it has worked fine until this update both during exercise and at other times. But have you updated to 1.0.1 yet .. that’s when the issue began. I can assure you that as a lifelong runner and triathlete, I have “watched” my heart rate extensively, and Apple broke something with the latest update. On my ride this morning in “outdoor cycle” workout mode, the watch pretty much read measuring whenever I looked at it. It should captur your HR every five seconds in workout mode. Reviewing the data in the Health app, I see gaps of three or four minutes with no readings, and some minutes with just one or two readings instead of 12. I have owned and used quite a few optical HR monitors from the Basis B1, TomTom Cardio, and Basis Peak and initially I thought the AW was the most accurate I had used, that was until the 1.0.1 OS update .. Now it is by a wide margin the worst of the lot. I hope the next update fixes things or mine is going back. I think we all know there is a bug, but as far as Apple goes, they haven’t acknowledged anything yes. I have sent them many feedback reports about the issue, including graphical comparisons of my heart rate with the AW vs. a Wahoo Tickr chest strap from before and after the OS update and they have not responded to me at all. It is striking to see how closely the AW tracked to readings taken by a chest strap prior to the update to how erratic the HR captured by the AW is now after the 1.0.1 update. I wish I could go back to 1.0. This mirrors my experience. HR on 1.0.0 was really good for me for all types of workouts and was taking HR regularly every 10 minutes when not using the workout app. It is pretty messed up on 1.0.1. Ray made a comment that the apple engineers were emailing him so maybe we can have better success if Ray contacts them. You should post your before and after charts here (if possible). I hope this has high priority at apple and there is a quick fix. Yeah, not sure there. In my discussions with them (pre-release) I have a better understanding on likely ‘why’ that’s occurring. See, there’s actually two ways the Apple Watch measures your HR optically. – The first is the one focused on resting HR, which is done with a different infrared sensor. This sensor is focused on trying to capture your resting heart rate – thus as a result if it detects significant enough movement it’ll skip that measurement. They really viewed this every 10-minute measurement as a focus on resting HR, not on ‘every 10 minutes no matter what’. – The second method is during a workout, when it engages the ‘more traditional’ optical sensors (the green lights). This records at 5s intervals, though in my discussions they seemed open to increasing the recording rate. We had a good conversation on why that’d be useful. Given that, I suspect what’s likely happening is that something has changed in the algorithm in the first section to be more ‘strict’ on when it takes that every 10-minute snapshot. Why they did that…not sure. Ray .. have you updated to 1.0.1 yet? I have updated and mine is totally erratic now in workout mode (every 5s recording), in addition to not capturing a HR every 10 minutes. See the link that was posted above from my post to MacRumors. This morning I did a 2+ hour ride in “Outdoor Cycle” workout mode and every time I glanced at it, the HR read “measuring”. I can’t say that my in-workout experience is any better or worse than before. It’s about the same. I generally have issues with outdoor cycling doing the same as you. And running depends on the exact workout. As for resting heart rate data, in general it’s actually giving me much more frequent data right now – anywhere from 2-3 times per minute, to every 5 minutes at worse. Go figure. However, I do see a handful of gaps, typically aligned to when I was active/out and about. Curious if anyone is using the Nike+ app or sticking with the Workout out. I’m coming from a Garmin 620 – and likely going back to it soon – but have been trying to use the Nike+ app this week. Of the 6 runs I’ve tried, only one has worked the entire way through. The app has stopped working during the others. It appears to lose communication with the phone and then is unable to reconnect. I even tried rebooting the Watch during this morning’s run, but that didn’t help. The phone app continues to work even after the Watch app stops. Anyone else having a similar experience? Will likely go back to the Garmin for daily runs until Nike (or someone else) comes out with a native app in the fall. I’ve used Nike+ for all my runs, about 15-17 total. I’ve had issues only twice. I use the Nike+ on runs both inside on a treadmill and outside. I’ve used playlist on my phone as well as selected “no music” and ran Spotify in the background. I’ve logged over 2500km with the Nike+ app. On my iPhone. It definitely has its issues, but since I like the app a lot I still use it. Though ever since I am running with the Fenix 3 I have enabled the data to be automatically uploaded from GC to N+. The only thing it doesn’t do is 1) which shoe I have used (so I enter it manually in either the app or N+ website) and 2) no elevation/speed graph in the N+ app when holding it in landscape orientation. Thanks, Scott. My issue seems to be that I lose the connection between my iPhone and the Watch. I keep my phone in a running belt behind me, so maybe that has something to do with it. Yesterday I just had Nike+ and the music app running, so nothing should have interfered with the communication with the Watch. I’ll probably try it again after the next update. Thanks, Phil. I hooked up the Garmin/Nike+ connection when it was announced in March, and have had no issues using my 620 with Nike+. In fact, the run usually gets uploaded to Nike+ during my cool down, so I’m able to indicate which shoes I’m wearing in the Nike+ (and then update the Garmin site later). I really wanted to get down to just using the Apple Watch for my non-training run, as I like the notifications and ability to change playlists without pulling out my phone. I’m also looking forward to apps having heart rate access, as I don’t like – and, generally, don’t wear – the Garmin HRM strap. But a Watch-only run for me just isn’t reliable at this point. Ah, ok, cool. Yup, I don’t think the watch is capable of replacing a dedicated running watch without a GPS chip in it. Though I do expect that to gain in a future generation. What I don’t think they’ll ever do is add cellular capability to it. That would cut too much into their iPhone revenue. Apple is making 70% of it from the iPhone alone. Completely OT this bit. Phil, I think the Apple Watch would work as my daily running watch even without GPS, since I never run without my phone anyway. And I don’t expect that will happen until there’s a watch with cell service. Looks like I missed that part. Well, in that case …shame on Apple. If the watch isn’t precise when used together with the iPhone during a run…wow. Think I’ll stick with my Fenix then. Yes, I use an armband and other then the two issues mentioned, I’ve had no problems using AW w/Nike+. And it should be noted even on those two problems, the Nike+ app continued to work on my phone. It is just once on the watch it crashed and the other it seemed to run the app twice at the same time w/two different songs! But what 6-8 months ago when Nike started doing significant upgrades, the app itself has not been reliable and I’ve had to restart it before even just on my phone (pre-AW). I know have the habit of closing all apps in the background right befor my run. This seems to help (tho Nike may have also fixed in an update). Now w/AW I still do that. And after closing all other apps, I do the run setup on the phone (pick indoor/out, type of run, playlist, etc). I then use AW to “start”. And of course use AW to view my pace, any incoming text (great feature), etc. I really like the “tap” to rotate between the large font display of pace, distance, time. Much easier than even on the phone of swiping. Over all I’m very pleased. Yes, more features are needed, But that will come. Scott, have you changed a playlist or podcast or done any other function on the Watch while using Nike+? I ask because I was testing RunKepper on the Watch yesterday and it was working great through mile 4. Then I took a call from my son’s school, decided to change my playlist on the music app, and resumed my run. The next thing I realized was that the RunKeeper Watch app stopped updating miles and pace, though the phone app carried on. I’m wondering if that’s the issue I’ve been having with Nike+. I’m testing out the iSmoothRun Watch app today – looks promising. I’ve changed playlist once or twice (just as a test) and it seemed to work fine. In the Nike+ app you force touch to have the option end, pause or change playlist. It seemed to work for me, but again, I only did it once or twice on short runs just to test it. Be aware, that for a while the Nike+ app even when just using the phone would only play songs that were on the phone, not on the cloud. If the entire playlist was not only the phone, it would skip any song on the cloud. This was annoying, and I’m not sure if they update to correct that. But that was not an AW thing, but a Nike thing. I’ve recently “discovered” Spotify Premium. So I have been using that a lot more. Selecting “no music” in the Nike+ app and just letting Spotify play in the background. I have not tried changing songs or anything w/Spotify on the AW. Spotify doesn’t seem to have an AW app, yet. I have not taken a call while using the AW during a workout. I have had people call, but as I can see who it is, so far, in all cases, I didn’t think I needed to answer during my workout. Overall I’m pleased with Nike+ GPS as an app and on AW. It is fairly simple on AW, but still does what I need. For example, if you end your run and want to post it to FB (who doesn’t :)) AW will refer you to your phone to complete that. In addition to my runs, I use it on non-run workouts (walking, weights, etc). This is nice as I had no real way to measure track those workouts. Scott, I think the issues I’ve had must be related to iPhone app usage while running. I went out yesterday to test out iSmoothRun – great app, by the way. At some point during the first mile, switched from using Overcast (for podcasts) to Beats Music and shortly thereafter the Watch app lost communication with the phone and stopped updating. Stopped my run, reset everything, and the next 5 miles it worked fine. I’m pretty sure I’ve done something similar on the times I haven’t been able to get the Nike+ Watch app to work an entire run. I’ll likely test it again at some point this week, although iSmoothRun write to Nike, Garmin and a whole host of other sites, and has more display customization, so I think I may have settled on my Watch app for now. I will say all this testing of the Watch and it’s various apps has made me appreciate the Garmin 620 even more (apart from the HRM strap). It works reliably, is easy to see and has plenty of screen customization. To be fair, though, the firmware had plenty of issues when it was first released at the end of 2012, but those have all be resoled (for me) now. That should read “at the end of 2013” above. Well I had my 3rd problem today on a 7.15 mile outside run. I used Spotify in the background w/Nike set to no music, setup done on phone and started on watch. Seemed fine, but at half mile when Nike gave me my update the sound was an echo and clear that the app was running twice at the same time. Since it wasn’t effecting my music, and my watch was staying up-to-date, I didn’t mess with it. If it saved two runs on the Nike site, I figured I’d delete one. Well at the end of my run all looked normal. When I posted it to FB it reflected .76 mile run! WTF? And when I checked in the Nike app, my 7.15 mile run had been replaced w/.76 (yet it still showed the same map). I added my actual run manually and deleted that short run. As I say during the run, my only clue that something was off was the sound of the updates Nike was giving me. And my watch stayed connected and up-dating. I’ve run this route enough to be comfortable that 7.15 is accurate. So that makes 3 issues out of about 16 (I’ve had AW a month and typically I run 4 days a week) w/Nike. No issues on using Apples “other” workout about 12 times for non-run workouts. I’ll keep playing and might try that iSmooth run if it updates to Nike. I hear you about Garmin. I had decided on a Garmin 220 when details of AW came out. So I held off and got AW instead. I saw apost on FB about getting a 220 for $125. For that price I’d pick it up in addition to my AW…lol…but could replicate the deal. I knew going in there would be hiccups. As I’ve said I had issues with Nike only using my phone. I’ll just keep playing and I bet lunch money things will improve. Scott, I did a 7 mile run with iSmoothRun today, along with the Garmin 620, and iSmoothRun worked perfectly. I picked a playlist from the Music app and stick with it through the run. I only received one notification – an activity one – during the run, but was able to dismiss that without affecting the communication between the Watch and the phone. iSmoothRun is great b/c it not only sends data to pretty much every tracking site (including Nike+), but it also is highly customizable. It has two active screens during the run, each of which has three fields for data. So my main screen showed lap pace, average pace and distance. The time of day is in the right corner (though very small and hard to read). It needs some tweaks for easy visibility in daylight, but it’s the best of all that I’ve used so far. It seems good enough now, and will likely be great once native apps are allowed. You may want to give it a look. Well here it is folks .. they’ve finally updated the document on the heart rate monitor function. Now it “attempts” to measure your heart rate every 10 minutes, but won’t record it if you are in motion? Huh??? One would think that is when you would want to record it to gauge calor burn. Not according to the geniuses at Apple though. Seems it is pretty much useless now as a passive heart rate monitor. Well….I don’t mean to disagree….As I think improvement is needed (and no doubt will come). However, heart rate is like blood pressure. A single reading is somewhat useless. Even if you go to the Dr and they take the “perfect” reading, they typically will not take immediate action until more reading have been taken. A single reading (or two) may not be representative, or be a fluke (either due to actually being an anomaly in the reading or a bad reading). That being the case, I wouldn’t say AW readings during non-exercise (passive) are “useless”. It is collecting a lot of readings. Even if it misses a few from time to time. Some days I see it taking 50+ reading. That is a lot of good data. And reading through you indeed see an “odd” reading or two. Or that is went an hour without taking a reading (for whatever reason). Now, I wish there was an easy way to export that to excel, graph it, etc. But I imagine that is in the works. Huh? I think you misunderstand me. Yes, one reading may be unimportant, that’s why it should take readings at least as originally advertised every 10 minutes, or with even greater frequency like the Basis Peak. Do you not plan to use your AW to gauge recovery from hard workouts? How do you plan to do that if it only takes one reading every couple of hours? My point was, there are other uses for the HR data points than just “recovery” measures. And I doubt any wrist base HR monitor can guarantee an accurate reading every X minutes. Many still think the chest straps are more accurate. Indeed it is interesting that despite the built in HR measurements, AW allows you to pair with a chest strap. This is a fantastic feature. Not the least of which is the most accurate, most consistent reading available to consumers. Understand I’m agreeing with you. Improvements are needed. I’m just disagreeing that HR measurements take by AW are useless. I can see in the future, the ability to change those settings. 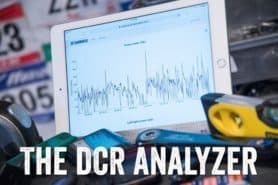 If you’re actually interested in recovery, then you’re interested in RR/HRV recording & analysis, and Apple Watch doesn’t record HRV. For “casual” recovery estimates a ten-minute or so sample is “enough” for a trend line. True. Unfortunately, you don’t even get the 10-minute readings any more with the AW since the 1.0.1 update unless you are completely still when it attempts a reading. I maybe get 3 or 4 readings during the day now. While sleeping, I get regular readings because of the lack of arm motion. I think the thing to remember is that AW is not a running or fitness watch. It is a smartwatch with extensive fitness/running features. Thus some features that might be thought of as useful for the runner were really designed/updated for other purposes. If HR is the end all be all to you (or just really important) why not use a BT chest strap paired to AW (or to an app you are using)? I ran w/my Nike+ GPS outside yesterday. It was warm an humid so threw on my BT chest strap for fun. Guess what? My AW seemed to automatically pair with it an I have readings (a dozen or so a minute) on my AW. Even tho I wasn’t even using the Apple “Outside Run” activity (I was using Nike+ which gave me a nice graph of course). Many people using AW are not runners or “really into fitness/workout”. But those HR readings can be valuable to them (and their Dr). But “resting” HR has to be just that, resting. Now, would I like to see a switch or selection for that? Sure. But the problem will be solve soon enough as Apple allows 3rd party apps to access the HR monitor on HR. At that point you will have apps that will do almost anything you could possible want. Hey Scott .. year I know I can use a BT chest strap (I have several and wear my Wahoo Tickr on most runs). But the beauty of the AW is an all in one device (almost sans GPS on the device. I have no problem wearing a chest strap during runs, but I am not going to walk around the office wearing it after my run when the AW should be recording my HR at regular intervals after the run (as it did in Watch OS 1.0.1). For instance, I went for a 7-mile run today at lunch with just the AW. It worked great, no HR dropouts or spikes, Avg HR of 154 which was right on par for me for the pace I was running. The last HR the AW recorded was 168 at 12:17PM (they unfortunately put my office at the top of a hill, thus the high HR). But since then I got just two readings … 67 at 2:03PM and 59 at 3:32PM. I just don’t see that as being as valuable as consistent readings since my run was over at 12:18PM. And, yes, I agree we will see some amazing 3rd party apps that will make the AW a much better training tool. FWIW .. 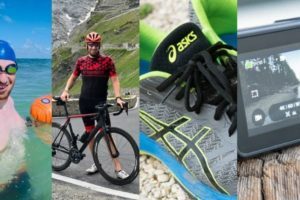 I am an early adopter and own many (too many, according to my wife) fitness devices (from the Basis Peak to the TomTom Runner Cardio and everything in between. My comments are just meant as constructive criticism to hopefully make the AW a better fitness/training tool for someone like me (lifelong runner, cyclist, and more recently triathlete). I have given much of the same feedback to Apple. 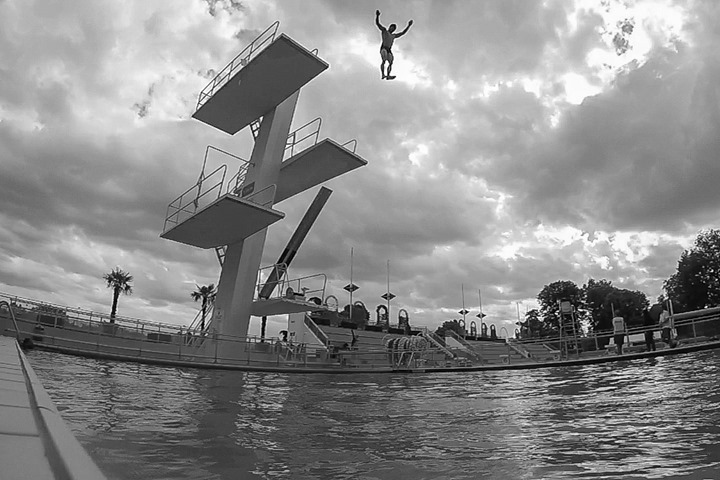 I must say when I reviewed the Apple Watch, diving off a ridiculously high diving platform never occurred to me. Fascinating read as always – looking forward to reading your running/cycling review. Good morning! Thank you for posting, these are the questions everyone is asking. My question, being that you now have an excellent perspective as to how well this watch will really hold up, is while the watch itself still works excellently, how does the microphone and speaker hold up after being put through these tests? In other words, have you seen a decrease in anyone’s ability to hear you clearly, or your ability to clearly dictate words to text? I went swimming at the sea with my Apple Watch so i could control the music of my phone placed on the boat (connected to the boat’s stereo through BT). It worked as long as I am in range. I of course did rinse it with fresh water asap to prevent salt water damage. Everything is fine. Apple watch should at least allow swimming and not recommending against it. They are big enough to cover the warranties (water proofing is a delicate matter). Next up is definitely iPhone waterproofing from factory design. This has been my top 1 request since the first iPhone! Thanx for the tests. I would like to wear my AW sport while pool jogging or doing water aerobics in shallow water. Will you be testing for that? I have PFS knee issues and don’t run. But can do exercises in the pool. Or is there a HR monitor which is waterproof and I can use with the activity app? Thanks again for the reviews. It’s good to know that a little water won’t hurt it. PS I have insurance which I believe covers water damage for the AW through Securranty. You have insurance covering water damage to a non-waterproof smartwatch? Most insurance “floater” policies would cover. They cover all-risk except for manufactures defects. Me? I just got Apple Care+ which of course would cover water damage (if it was damaged). Just like it covers water damage on my non-water proof iPhone. Little more money, but easy to deal with. The advantage of a seperate policy is that a floater policy would also cover theft. Yes the insurance says it covers water damage including total submersion. Securranty.com I live in the United States I don’t know if it’s available everywhere. But it was quite a bit less expensive than my carriers plan. Sorry it says “liquid damage” is covered. I’ve been also checking the website regularly waiting for the Apple Watch review. My guess is, since Apple is working with Ray, he will wait for Watch OS 2.0 to do it. Current version, at least for me, has been very inconsistent and limited in a lot of ways. But then again I have decided to live with it and sell my other sport/gps watches, since this is clearly the future. I still enjoy using mine. I don’t find it inconsistent. In fact I find it very consistent. My biggest issue is how painfully slow it is with 3rd party apps (I use the Nike+ GPS app). But that should be improved with the upcoming 2.0 since you will be able to load 3rd party apps on the watch itself. Overall still happy I went with AW over the Garmin 220 I was looking at. No regrets. Any sign of the full review? Can’t wait! Timing would be great! I would read this while waiting for my new iPhone 6s Plus. I want to change my Forerunner 220. Runners up are Fenix 3, Apple Watch.. or waiting for Fenix 4. Don’t buy the Fenix 3, a total shyte product. Basically don’t buy anything from Garmin. Just read a random forum page and you’ll see that Garmin cannot write solid software. Ironically, if you visit the Apple forums, you’ll see people upset about various Apple things. That’s sorta what happens when you visit company forums. Same with Polar or others. should we just stop expecting an apple watch in depth review? Or do you have any news for us? Thanks..
It’s not dead, just backlogged with everything else everyone else wants here review-wise. That’s all. 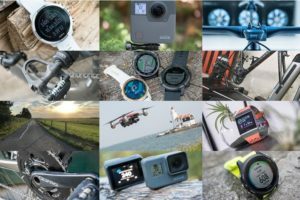 The Eurobike/Interbike/ANT+ Symposium sweep of September is a mess, and trying to fit in WatchOS 2 testing as well (decided to roll that in to my post rather than just posting ahead of it). Thanks for letting us know that it is not dead!! I will continue to hold on to my really beat up fenix 2 until the review is out and I can then compare aw to the 225. Thanks again! I was really disappointed because you had kept dodging the questions, I thought for sure it was never gonna come out. Could you tell us more less in how many days/weeks we could expect the review? sounds like you need a helper. I\m game…. Would give you some MTB focus on your reviews. Im sure many would love to see that. I just ran the Portland Marathon and one of the funniest sights was a man with his iWatch. I saw the iWatch because he had his fingers at the jugular, trying to get REAL measure of his heart rate :)! – Boxes upon boxes of random things companies have sent that don’t have a prayer of getting a review considering everything else in this list. Realistically, there probably won’t likely be a review on those in that last category. Of course – all of this ignores new things that come out, by all assortment of companies. Plus regular posts that aren’t reviews. I think I can maybe answer the question for you. Do you want a watch because you do a lot of sport and care about getting good exercise data to monitor or shape your training? As an Apple Watch owner, I totally agree with Urtenman. If your goal is to win the next Boston Marathon or quality for the Olympics, get a dedicated, high end, running watch. If however, you run for run, health, fitness, like to run in races and perhaps improve in your age class and get better. You can absolutely do all that with Apple Watch. I can say that with 100% confidence. Why, because runners all know improvement is within, not some external technology. But yes, Apple Watch (I wouldn’t trust anyone who doesn’t even know the name) can help you improve. I continue to use Nike Plus GPS, just like I did before I got Apple Watch. It works fine (a little slow on start up that hopefully with improve when Nike takes advantage of OS2). The fitness rings are very motivating and I like that the “move” goal is adjustable. It is important to me to see if one of my kids needs me while I’m out for a run. And I can with just a glance. I almost bought a Garmin 220. And decided to wait for the Apple Watch. Got mine one week after it came out and still wear it daily and love it. Battery life has not been a “real life” issue. Often I even sleep with it on and charge it in the time it takes me to shower and dress in the morning. It is not perfect. I wish it had more customizations (I want text messages when I run, but no other notifications), but overall, I like it, since prices on dedicated running watches have dropped, thought about getting one even with Apple Watch. But just don’t see the need. Count this as another vote for the Apple Watch OS2 review. Nobody does it better than you, Ray. And I’ve come to trust your judgment and in-depth evaluations so much that I always check here first before buying any new fitness tech. As interested as I am in some of the other products on your immediate task list, I’m much more eager to get your take on the Apple Watch as a fitness device. My Garmin FR 610 is getting long in the tooth, so it’s time for an upgrade. I’m suspecting real distance between, say, a Garmin Forerunner 620 or 225 and the Apple Watch, but given the other capabilities of the Apple Watch, I’d like to have a thorough sense of the degree of separation for fitness metrics before I take the plunge. I also vote for your review of the Apple Watch. I own a Garmin 620 and an Apple Watch. I really like my Apple Watch and it is hands down a better watch for day-to-day usage beyond just running. The Garmin 620 can still do more from a running metrics perspective. The battery life is much better on my Garmin especially on long 4 1/2 hour runs. But hands down the Apple Watch is a much better overall watch for $399 if like Scott said you are a runner but not training to win Boston or qualify for the Olympics. Ray, I’m sure you think from a logical standpoint a review of the Apple Watch ranks low on your priority list as it is not a dedicated GPS running or triathlon specific watch, but it is clear it is raising the bar with Garmin and other companies. From my brief review of coming features in the Garmin 630 and 235 etc. it appears Garmin is trying to stay relevant and play catch up with the Apple Watch. Truth be told if you’re an average runner and are going to spend $300 – $400 on a watch for running and also want a Smart Watch then in my opinion the Apple Watch is a far better choice than even the new Garmin watches. Garmin may be adding the ability to load apps, but come on, Facebook and other major players aren’t going to make an app for the Garmin. Garmin is great at tracking running metrics but is clearly not a tech savvy company. I love Garmin watches and was the first to have both the 610 and 620 when they came out. I beta tested both watches for Garmin. I really wish Garmin would make an app for the Apple Watch that displayed all the data the 620 does on screen. That would be my ideal app. I know they will never do it as it canibalizes there business, but if they updated it I would probably pay $30 to $40 for such an app. Ray, Runkeeper just came out with a WatchOS 2 version of their app today for the Apple Watch. Before this update, Runkeeper is the best Apple Watch running app I’ve found besides the Apple Workout app. I like that Runkeeper announces intervals as I do run/walk. I just wish it had lap pace mile splits, and interval countdown on screen like the Garmin 620 does. Keep up the great work Ray, your reviews are awesome that is why everyone is so eager to see an Apple Watch review. Excellent points and the reason I waited for AW rather than get the Garmin. AW is simply a better value for the non-professional runner. AW is worn and useful every day, all day. A dedicated GPS running watch is “really” only useful the what 7-10 hours a typical, recreational runner runs per week. And btw, I’m sure other Smart Watch’s would be similar. I don’t think AW is unique in what we are talking about. But the article is about AW and they certainly have made a splash. I agree, I wish Garmin would make an app for AW. And my bet is they will. I remember loading the $99 (at the time) TomTom app on my iPhone 4. Turned my phone into every bit as good as a dedicated, stand alone car GPS. I do like using Nike+ GPS. But really, only because I’ve used it since about taking up running five or so years ago. I would be interested in other apps. I only run distances up to half a marathon. AW has no issues with that. But I wouldn’t know about full marathon. I would think it would last. I actually wish they would allow an option to leave the screen on during runs. I know that would drain the battery faster, but I think that is something I’d be willing to manage. I imagine the hard part of doing a AW review, is exactly what to cover. The entire watch? Only the fitness aspects? Only the running options? Only native Apps? 3rd party? Bands (I’m not a fan of the Sport band)? The “problem” with reviewing AW (or any smart watch) is, each person uses is differently and has different functions that are important to them. For example, I read, enjoyed and found interesting the blog about how water proof AW actually is. Yet, I’m not a swimmer, so really doesn’t interest me. But I know others are…so it should be covered. 6 months on and still no Apple Watch review. It can mean only one thing: It’s not good for intense workouts. The only article on the site is about how it survived going for a swim. I think DC doesn’t want to do a full review of the Apple Watch because a poor review will affect his relationship with Apple and future goodies. But by just posting an article on how it withstood some swimming tests he keeps his relationship solid without spilling the beans on how underwhelming the Watch is for running, biking, etc. I love Apple and I’ll be getting a gen 2 AW but I would have loved to read his super in-depth review. I have a pretty minimal relationship with Apple (heck, I’ve paid for three of my own Apple Watches now), so not sure I really have anything to lose. I’ve actually spoke multiple times (podcasts, occasional posts, etc…) that the Apple Watch isn’t good for intense workouts or cycling. It’s simply a case of shifting priorities to try and keep up with all the reviews and what the majority of people want reviews on right now. That’s all. That said, I do still want to publish a piece on the Apple Watch. I might do it as a combo Apple Watch & Microsft Band type post. Not sure. Though, neither are very good for fitness. Hope you are well. I’ve been using my fēnix 3 as my daily activity tracker since I bought it. I have recently purchased an Apple Watch and have been using it as well, although not DCR style (both at the same time). My question is, how do I get the steps I accumulate on a particular day via my Apple device sent to Garmin Connect. I don’t seem to be able to find anything on the www that will help me in this quest. Just curious, does anyone know a an app to track distance while swimming with the apple watch? Is this even something that could be developed? I was just wondering about the automated chamber, tablet and pump system. I run dive service business in Sydney Australia and this would be an awesome tool. Just replied to you with additional details via e-mail. But it was made by Bonica Dive company, which makes Bonica cameras. It was a custom build job. I went swimming with it on some occasions. Setting it to a free training and locking the screen. And I am a far less professional swimmer than the author. This is an indoor watch ONLY. It’s not officially waterproofed, so it stands to reason that eventually that would happen. the best facilitator I ever met. I actually found really impressive accuracy of the Apple Watch Series 2 GPS when it earlier this year (better than Garmin or Suunto in fact). The only challenge I had then was that I couldn’t get the darn thing exported out. But the good news is that I’ve got a 3rd party app (I don’t think it’s released yet), that’ll do just that now to .FIT files.